Mt. Echia (also called Pizzofalcone and Monte di Dio) does not particularly stand out today in Naples. If you do notice it, it appears as a bulge near the Egg Castle. Today, its prominence is obscured by the 20 or so modern square blocks of tall buildings added to the city during the Risanamento (urban renewal, see map below) in 1900 between Mt. Echia and the sea as well as the very large buildings now built on the hill, itself. (The Nunziatella military academy, the red bulding, far left-center in the photo, seems to stand out the most.) 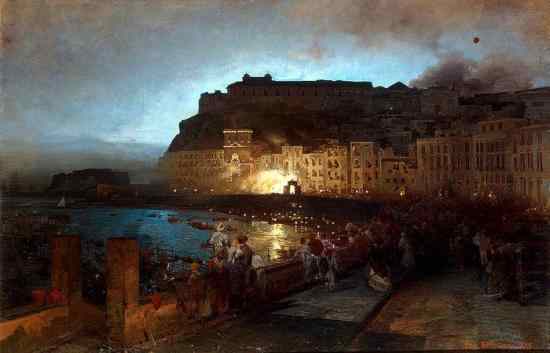 Yet, before there was an Egg Castle, and, indeed, even before there were Romans in Naples (or anywhere! ), this bulge supported a prehistoric population and was the hill upon which the Greeks later built their city, Parthenope, which then merged with the late-comer, Neapolis (Naples). In Roman times, Mt. Echia encompassed the famous villa of Lucius Licinius Lucullus, who added the expression "Lucullan splendor" to our vocabularies. His villa and gardens extended down the side of the hill to the waters in front of the isle of Megaride, where the Egg Castle would later stand; they may even have extended to the east to the point of today's main port) where the Maschio Angioino would later be built. Santa Lucia, no longer on the sea front! The rock that Mt. Echia is made of is the classic yellow Neapolitan tuff, the most widely used of all building materials in Naples. The inside of the hill is honeycombed with quarries, caves, aqueducts and tunnels both old and new. These underground spaces include everything from the Greek cavern and Temple of Mithra to the modern Vittoria Tunnel (1929) and everything in between: the Bourbon Tunnel (the 1850s) (recently renovated as a tourist attraction), a vast network of aqueduct lines (both ancient and new), and large private quarries to supply building material. There is even a modern elevator in the Vittoria Tunnel to provide easy access to offices of the telephone company up on top of the hill. (I imagine it is only for those who work there. Peasants have to take the long way around—and it is long.) The surface of Mt. Echia is overbuilt with an astonishing array of structures. Besides the Nunziatella (mentioned above) these include another large military headquarters and barracks, the Serra di Cassano building (seat of the Italian Institute for Philosophical Studies), and the top entrance (#1, below) of the three-tier station for the new Metro line 6 (under construction, #1 & dotted line, below). Most of the spaces burrowed in the hill served as air-raid shelters during WWII. More recent additions to the honeycomb have included the never-finished train tunnel (#6) beneath Piazza Plebiscito, started in the late 1980s and then abandoned. There were many changes to the city from 1885-1915. They include the new blocks shown below in orange along the sea as well as via Partenope. It is all on land-fill. The original seaside roads were via Chiatamone and via S. Lucia on the west and east, respectively. Via Chiaia bounded Mt. Echia on the north. The irregular shapes shown in green and blue are cisterns cut into the rock at various times through the centuries. They were joined to various aqueduct lines (the black lines). No surface structures on Mt. Echia are shown on this graphic; the pale green patches are blocks of buildings; the white spaces are streets and squares. #2. The Grotto of Mithra; #3. & # 4. are related: #4 is where the Bourbon Tunnel builders first dug into the hill. 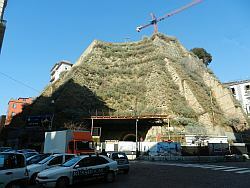 That space now houses a multi-story car-park; that opens onto n. 3, the old Carafa Quarry and the entrance to the Bourbon Tunnel archaeological site; #5. West entrance, 700-m. "Vittoria" traffic tunnel (1929) (photo 2, below). It exits on the port road below the Royal Palace, just off the right-hand side of this map. Numbers 2, 3, 4 & 5 are all at street level (almost sea level), well below #1 and the entire Echia hill. The hill slopes up from #1 to #7 (c. 100 m. above sea-level). #6. Piazza Plebiscito, with the Royal Palace on the east is well above the street and sea level of the western side of the Echia Hill. The dotted lines at #6 show the now abandoned tunnel of the Rapid Train line from the 1980s. #7. The original "corner" of Mt. Echia (photo 3, below). The solid line indicates a large, high retaining wall. #8. The Lamont Young ramp. You can hike up to the Mt. Echia height here. Or you can (a) come in at #1, (b) walk up at the south side of Piazza Plebiscito or (c) use another stairway just north of #7 on the map. "The huge quarry in green [top left on map] has an interesting back story as well. The entrance to what is now the multi-screen cinemaplex, and what you will remember as the old Metropolitan Cinema is right there on the curve in via Chiaia not far from the overhead roadway arch. I used to go to the cinema when I was trying so hard to learn Italian ... Had no idea it was in the huge quarry. Do you know about the emergency exit? It is the long lighted tunnel that leads up the side of the green giant, heads up its left side, loops up, then back down and then turns basically West and exits onto rampa Brancaccio. Also, after the Metropolitan closed, it all remained vacant for a long time, then some promoters were going to put in a huge parking garage but that got defeated and the cinema multiplex finally was built, utilizing the huge central area of the quarry. "...the narrow quarry that enlarges on its southern end in yellow right at the tip of your dotted line arrow was going to be a private gold mine after being converted to parking. During the Mussolini days, a shady entrepreneur was going to develop this into a large parking garage by having an access road cut somehow basically off the Santa Maria Capella Vecchia near the rampa Caprioli. The Duce and his boys nixed the deal." If you walk counter-clockwise around the hill, you can start at the Royal Palace (#6) and walk west up via Chiaia. Below the bridge at #1 (photo 1, below) there are stairs and an elevator up to the hill. 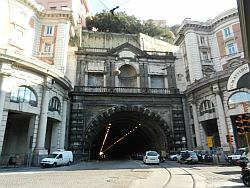 Or keep going to Piazza dei Martiri, turn down via D. Morelli and pass #'s 4 & 5 by the tunnel entrance (photo, below). You can also walk through the tunnel to the port, but don't.) 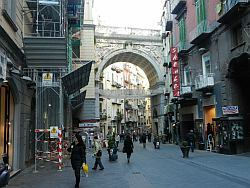 Continue on via Chiatamone where you will walk between the original hill and the string of high buildings from 1900. There is a ramp at #8 that takes you to the top and the soon (we hope) restored villa Ebe, home of architect Lamont Young. Or keep going and turn left around the corner at the retaining wall (#7) [photo, below right]. That puts you onto via S. Lucia, one block from the coast. (There is another stairway up the hill not far from that corner.) Via S. Lucia slopes up to meet via Cesario Console at a point slightly off the right side of the map. 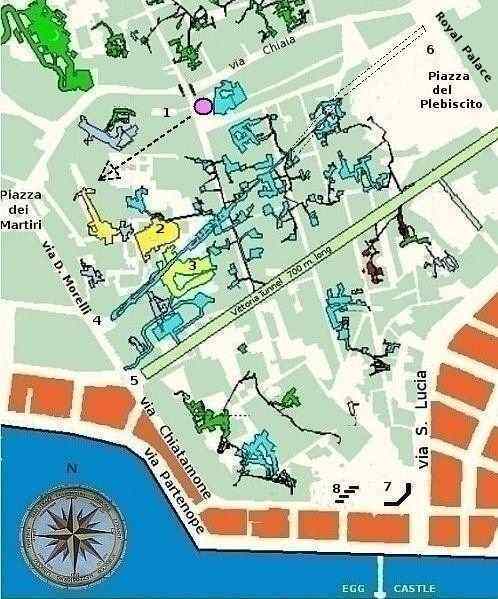 Turn left onto via C. Console and you are almost back at Piazza Plebiscito and the Royal Palace. From via C. Console there is an external stairway down to street level and the small Molosiglio boat harbor below the Palace and, at the beginning of Piazza Plebiscito, there is another stairway and elevator down to the eastern exit of the tunnel that you wisely decided not to walk through. Finally, note in photo 3 the construction site at the base of the retaining wall (#7 on the map). It is the bottom station of a passenger elevator that will connect via Santa Lucia (at sea level) with the top of Mt. Echia, where there is a similar construction site. The plan for the lift was proposed in 2005. Construction began in February 2009 and is supposed to finish in April 2012. They are behind schedule, but not by much. I spoke with a man on the job yesterday and asked, "Weeks, months or years?" He smiled and said, "Maybe a few months." The heavy lifting and digging is done; that is, the shaft, itself, from the top of the hill down to the bottom is done. The perimeter of Mt. Echia at the top is still sealed off as they prepare to build the external station and entrance. The remaining work is much more than cosmetic, however, and I give it a year. The elevator would benefit the population of Mt. Echia immeasurably; there would finally be an easy way to get up and down. Tourism would increase. (It is currently at zero.) That fact, alone, should improve the degraded state of some of the streets and buildings on the upper perimeter of Mt. Echia. The original plan called for a rebuilding of the nearby Lamont Young Ramp as well as other sections up on top. Whether that will follow the opening of the new elevator remains to be seen. Obviously, the fabled panorama will never be what it was because of the modern insertion of 20+ blocks of seaside buildings (the orange segments on the map, above). They could implode a few of those (!) but I don't think that will happen. map credit: The original map indicating cisterns, tunnels and aqueducts comes to me through the kind courtesy of Mr. Fulvio Salvi of Napoli Underground (NUG). With his help I have altered it from the original for this page.